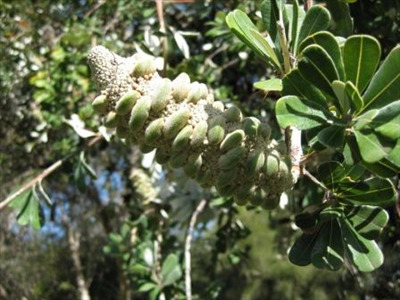 Medium tree suitable coastal or inland, erosion control, frost and wind tolerant, cut flower. Yellow flowers autumn-spring. Interesting foliage and seed pods, dries well. Rare pink form sometimes available B. integrifolia subsp. monticola. One of my favourite banksias as it is so easy to grow and produces untold rewards! Great street tree and landscape specimen. Survived 16F with no damage in Casitas Springs.